Product prices and availability are accurate as of 2019-04-16 04:39:28 UTC and are subject to change. Any price and availability information displayed on http://www.amazon.com/ at the time of purchase will apply to the purchase of this product. 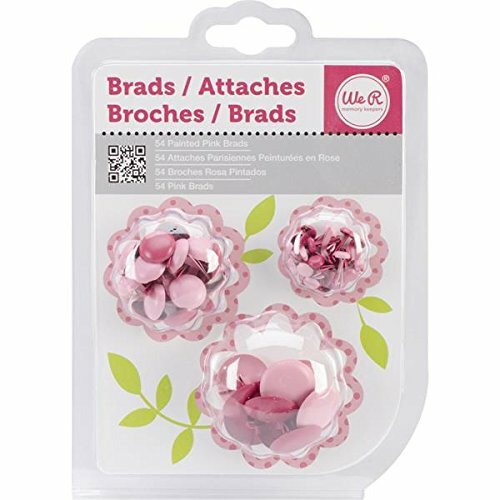 The We R Memory Keepers Brads are Great for Embellishing all of your many projects with Style. Available in Painted or Glitter Finish, this 54 Pack contains 3 Sizes and 2 Artfully Coordinated Colors. Great for Embellishing all of your many projects with Style Available in Painted or Glitter Finish 54 Pack contains 3 Sizes and 2 Artfully Coordinated Colors Look for our Brad Setter and Piercing Tool Count make adding Brads Count your project that much Easier Look for our Brad Setter and Piercing Tool to make adding Brads to your project that much Easier Look for all of our other We R Memory Keepers and We R at Home High Quality Products and Tools!